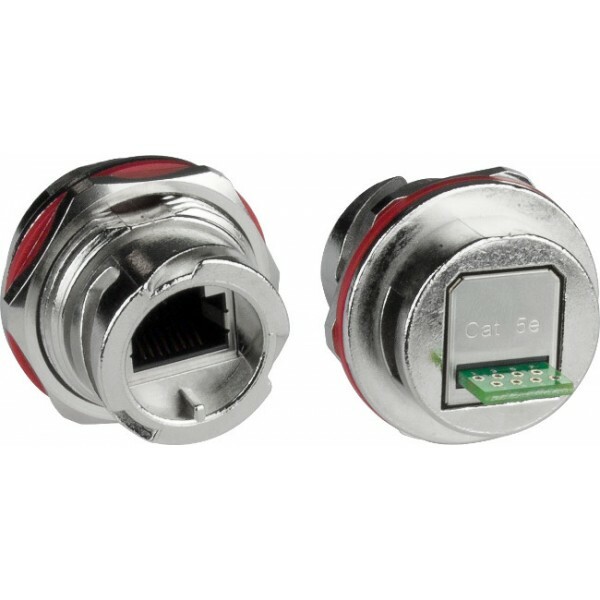 Nickel plated zinc alloy IP67 rated weatherproof RJ45 feed-thru to PCB board. Nickel plated zinc alloy metal construction. RJ45 pass-thru receptacle to PCB board with through holes for soldering wires. Quick Release bayonet style connection twists and locks into place. Gasket seals provide IP67 rated water and dust protection. CAT5ea shielded cable with a 6mm-7mm O.D. is required for waterproofing. How to use: can be front mounted to a maximum panel thickness of 3.2mm. Requires RJ45-5EWTP-QR-CB-SHLDM cable side shield for complete connection.